I don’t often venture into Chelsea – much to the relief of my bank balance – but while I was in the area visiting the latest exhibition, Champagne Life, at the Saatchi Gallery, I decided a quick detour via The Good Life Eatery was needed. 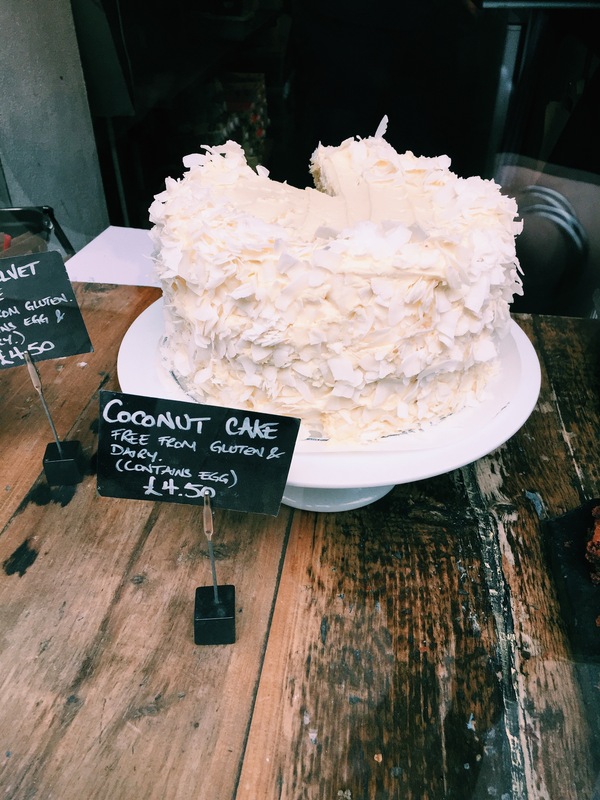 Situated on Sloane Avenue, The Good Life Eatery is the kind of place you could easily walk past, but once you spot the cakes sitting pride of place in the window, you will feel obliged to step inside for a closer inspection. The coconut cake, in particular, was calling my name. Once inside, prepare yourself to make some tough decisions – the menu is extensive. 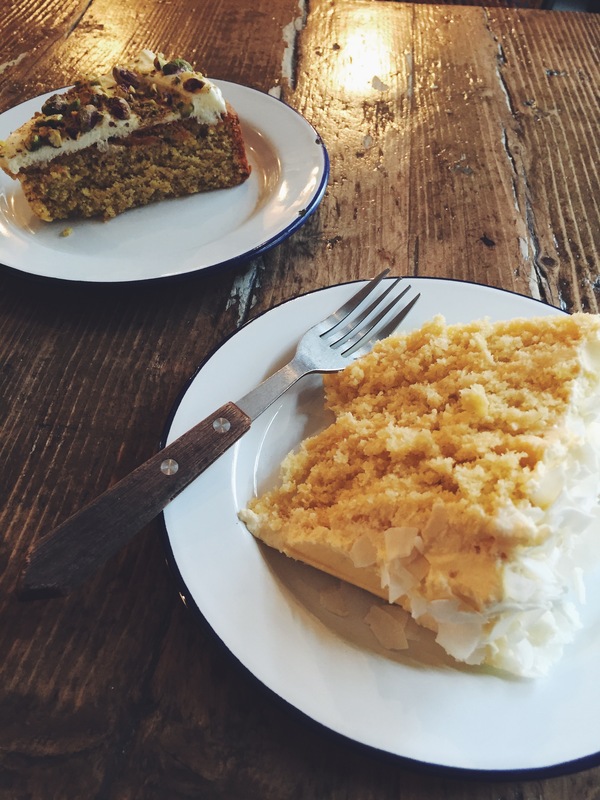 It caters to every kind of diet you could imagine, be it vegan or gluten free, and it also caters to people like me who just like to pretend they’re being healthy while they scoff a slab of cake. Guilty as charged. 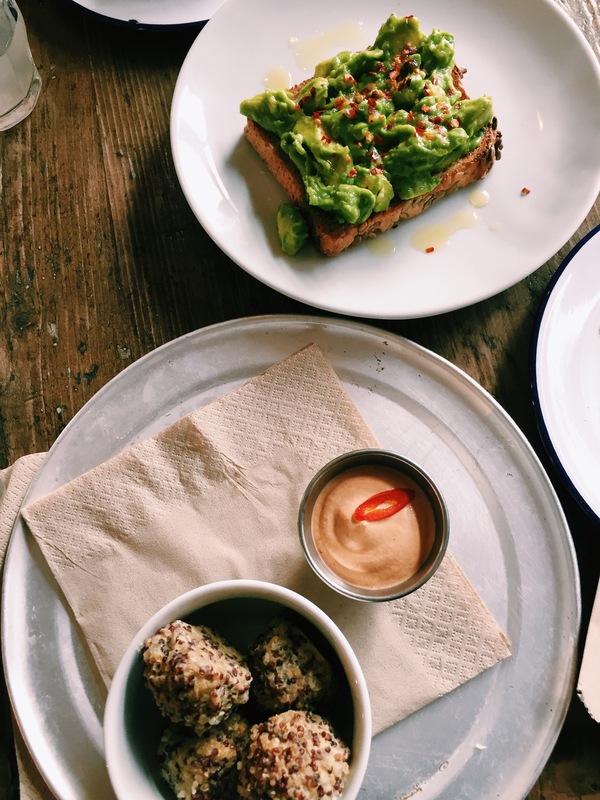 Before we got down to the cake scoffing, we ordered a plate of avocado chilli toast and a portion of quinoa and cauliflower falafel, with chipotle cashew cream. 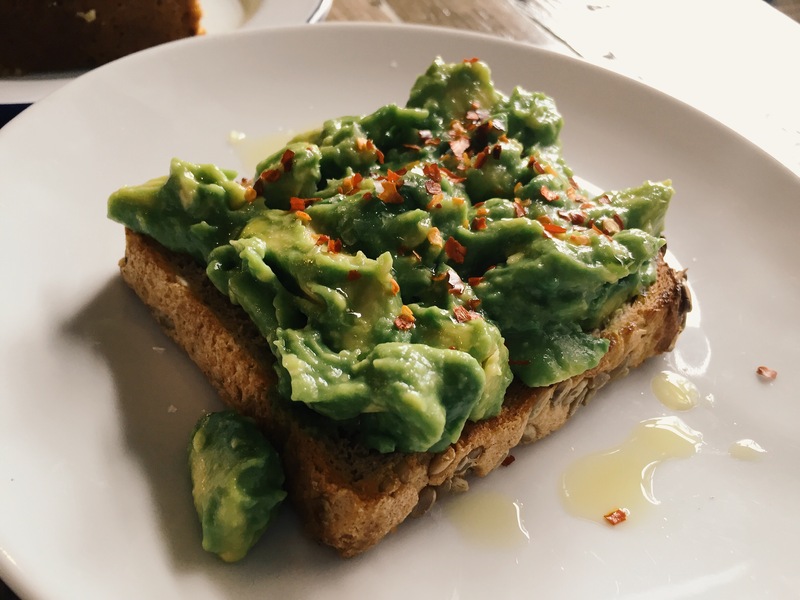 The avocado was delicious; a mound of vivid green and generously chunky mashed avocado, a healthy sprinkling of chilli flakes and a drizzle of oil on top of the bread, packed with sunflower seeds. My avocado was overshadowed, however, once I got a taste of the quinoa and cauliflower falafels. 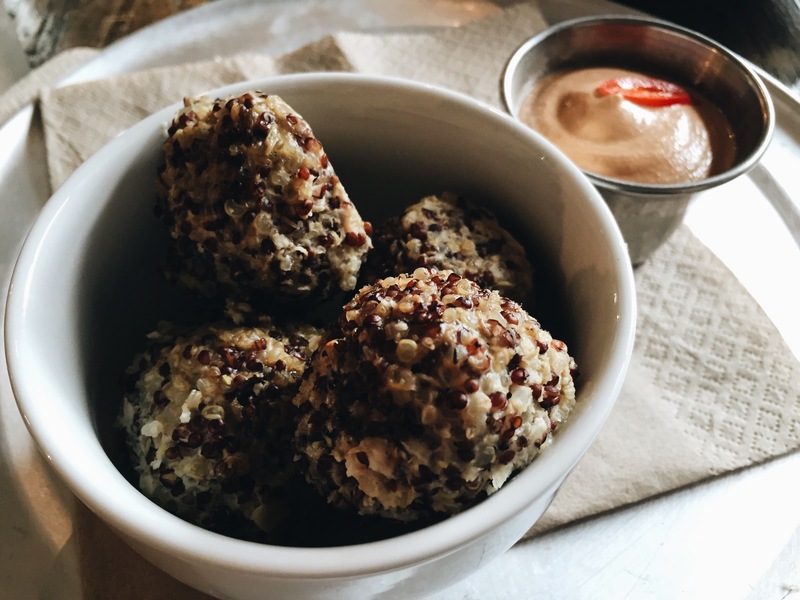 These weren’t like any falafels I’ve had before but they definitely hit the spot; light and fresh in flavour with a subtle crunch from the quinoa, while the chipotle cashew cream packed a rich smoky heat. The cashew cream was not only intense in flavour, but so luxuriously creamy I hadn’t even realised it was dairy free until I saw the menu again. Total cashew sorcery. After a veritable feast of plant-based goodness, it was cake time. Our eyes lit up as we were served two generous slices; one coconut and one wheat-free pistachio and rose cake. The pistachio and rose cake was delicate and floral, and the earthy crunch of the nuts offered a perfect counter to the sugary frosting. In my eyes, however, it was the coconut cake that stole the show; creamy and sweet, perfectly moist and coated in shreds of coconut. This cake is my soulmate. The Good Life Eatery definitely lives up to the hype. It’s especially worth a visit if you have any allergies or dietary requirements that can make eating out troublesome – you will be overwhelmed with choice here. Admittedly, it’s a little pricey, but I think it’s justifiable when you consider the quality of the ingredients and the location. Seating is limited, so be sure to arrive early or visit outside of peak hours to ensure you get a seat. Have you visited The Good Life Eatery before? This is on my list to go to when I am next in London!